Successfully Added 1 DIN Car Stereo - For Nissan X Trail, Android 8.0.1, Bluetooth WiFi, 3G&4G Dongle Support, GPS, CAN BUS, Octa-Core CPU, 4GB RAM to your Shopping Cart. 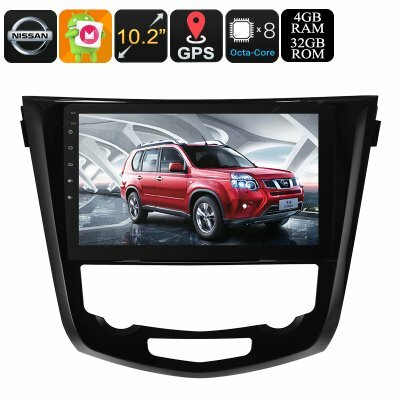 If you are looking for a way to bring entertainment into your Nissan X Trail (model 2014 - 2017), this 1 DIN car media player is perfect for you. With its Android OS, this car gadget is so much more than a regular car stereo. Naturally, it comes equipped with a standard FM/AM radio and Bluetooth features that allow you to listen to all your favorite tracks. Added to that, its Android OS lets you play games and watch movies. Thanks to its WiFi and 3G dongle (not included) support, you’ll even be able to browse the web straight from your dashboard. With this Android media player in your car, you’ll always be able to stay connected and your passengers will never feel bored again. On its 10.2 Inch HD display, this car stereo portraits all your favorite media in vivid color and crisp 1024x600p resolutions. This means that your passengers will be able to fully enjoy their entertainment to the most. The one DIN media player comes packed with an Octa-Core processor and 4GB RAM. With this hardware at your side, you’ll be treated with enough power to tackle all basic Android applications. Thanks to its CAN BUS support, you’ll even be able to browse through all the features this stereo has to offer by simply using the buttons on your car’s steering wheel. This brings along high efficiency and lets you adjust settings without being distracted. Besides all the fun this one DIN car stereo brings along, it also features a highly accurate GPS navigation system. From now on, you’ll be able to head out on your upcoming road trips with confidence. With this car GPS at your side, you’ll never have to worry about getting lost again. By supporting 20 channels, you’ll be treated to highly accurate readings. This car navigation system will lead you to your destination in the fastest and most efficient manner no matter where you’re at. By working on Android Maps, this car stereo lets you easily insert the maps of your liking via its SD card slot. Along with its 32GB internal storage and 32GB USB input, you can be assured that there’ll always be enough space for your maps, music, movies, and more. Arabic: - استريو السيارة - Chinese Simplified: - 汽车音响 - Czech: - Autorádia - Danish: - Bil stereoanlæg - Dutch: - Autoradio - French: - Autoradio - German: - Auto-Stereoanlage - Hebrew: - סטריאו לרכב - Hindi: - कार स्टीरियो - Italian: - Stereotipia dell'automobile - Japanese: - 車のステレオ - Korean: - 자동차 스테레오 - Malay: - Stereo Kereta - Norwegian Bokmål: - Bilstereo - Romanian: - Masina Stereo - Russian: - Стерео - Spanish: - Estéreo de automóvil - Thai: - เครื่องเสียงรถยนต์ - Vietnamese: - Âm thanh nổi xe hơi.